I think that I've been on a green kick lately. My eye has been drawn to that particular color almost every time I see it. Now I don't often buy myself jewelry but I thought that these little necklaces would be nice accents to my usual t-shirt and jean wardrobe. Especially since one of my favorite cardigans to wear is a nice shade of olive green. I may swap out the black rat-tail cords for nice green ribbons instead. The one on the left is dichroic glass and was found at the San Mateo sewing festival. 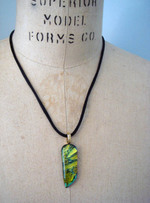 Here's a few etsy shops that have a nice selection of dichroic glass pendants. GlassElation, CCValenzo, Ryanstones ... I'm sure there's many more shops, but these are the first ones that caught my eye. 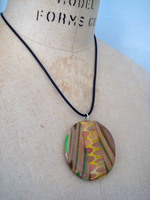 The beautiful pendant on the right is made from colored pencils! Yes, that's right, those are slivers of colored pencils that are then laminated together. It's from Jen Maestre's etsy shop. If you've never seen her work before you should head on over and check it out. Truly gorgeous work. I've wanted to open an Etsy shop from the first time that I discovered them in February 2005. What a great concept, a place to buy and sell all handmade items. My husband has been such a great support to me. He's the one who kept encouraging me, telling me that I should jump into it. So I've been researching different art papers and where to buy quality shipping supplies. And you've seen my new logo that I designed a couple weeks ago. It's finally come together this afternoon. Announcing the grand opening of the Lemon Tree Tales shop - home to Lemondrop & the orchard fairies and all sorts of whimsy.